This left facing, ½ length, seated portrait depicts emancipist convict Mr Tompson (aged 52) as a respectable gentleman farmer of substance. He is posed in a domestic setting, seated on an elbow, or carver, chair (probably of colonial manufacture) with an elaborately tasselled, deep yellow [velvet] curtain draped across the wall behind him. He wears a three-piece ensemble of unmatched suiting, as was typical of the period, comprising a long-tailed, single-breasted dark wool jacket or coat, with notched lapels, peaked shoulders and fitted sleeves with turn back/button-fastening cuffs, over a double-breasted fawn-coloured waistcoat fastening with flat [brass] buttons, notched lapels and two pockets, with a black ribbon watch fob and winding key just visible above a pair of mid grey trousers. His [finely pleated] white linen shirt is high-collared, wrapped with a pleated black stock, or neckcloth, and worn with a small rectangular gold pin set with a brown stone or hair, perhaps a sentimental token. 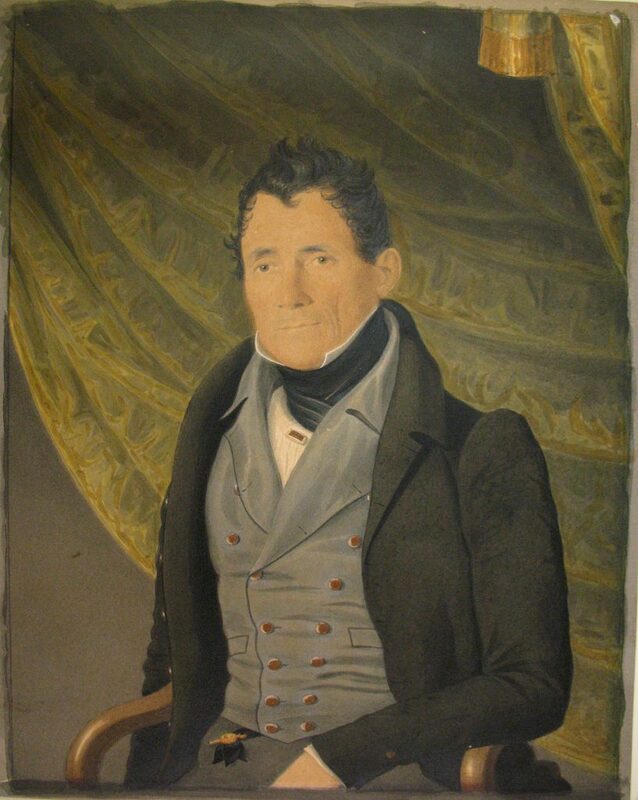 Mr Tompson is clean shaven and his own dark hair has been fashionably groomed and brushed-forward in the romantic style favoured during the early 19th century. Charles Tompson (1784?-1871), emancipist farmer, was convicted at Warwick, England, in March 1802, and arrived in Sydney in the Coromandel in May 1804. Employed for four years in the office of Commissary John Palmer; he later kept a shop at the corner of Pitt and Hunter Streets, and owned ‘Clydesdale’, a 700-acre (283 ha) farm near Windsor, between 1818 and 1851. Tompson married Jane Armytage on 25 August 1822, following the death of his first wife, Elizabeth, née Boggis. Subject posed on a [cedar] carver chair with elaborate curtain drapery behind.